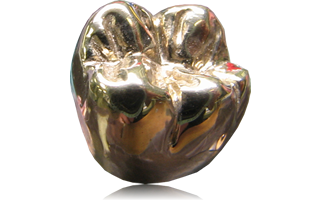 Full Cast Metal restorations are simply that – all metal. There is no porcelain covering, and the dense metal structure makes them the unchallenged standard for long-term durability of posterior crowns. All yellow gold restorations meet ADA specifications for noble gold or high-noble gold..